Order the Kindle Edition Now! 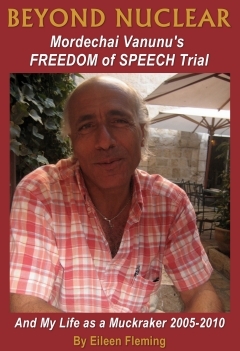 Eileen Fleming's book Beyond Nuclear: Mordechai Vanunu's Freedom of Speech Trial and My Life as a Muckraker is a fascinating insight into the life and mind of an activist pursuing a moral crusade against the might of a nation - in this case Israel. It also provides a journal of such an individual's experiences in the complex and protracted struggle of the Middle East. Her journey of faith and belief in support of the Palestinian cause - and in particular that of Vanunu Mordechai, the Israeli dissident who served 18 years in prison for revealing Israel's illegal nuclear programme - has been a remarkable one: she clearly believes she has a purpose and that she is guided by a higher will and perhaps this is the secret to the huge radical energy she exudes. 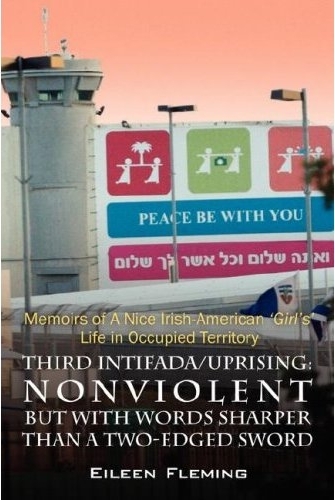 Her book is an expression of that energy and of the uncompromising commitment she shares with Vanunu in attempting to right the injustices she sees in the daily lives of Palestinians. Her visits to Israel and her meetings with Vanunu and others in her efforts to publicize the story the mainstream media largely ignore - especially in the US - is inspiring. There are few who would doubt the hardships and injustices suffered by the Palestinian people in Israel and its adjacent lands, nor the inadequacy of the international community's efforts to lessen their plight, but Beyond Nuclear brings this sharply into focus. But it is the humdrum indignities that are suffered by Vanunu, the petty restrictions, the heavy handed reactions of the authorities that are most striking: the sense of isolation which Vanunu endures daily, an outcast from his own people - a man on the outside - which has become a metaphor for the Palestinian situation: the Middle East has always been a cauldron of tension and conflict - it is the story of the Old Testament - but it has never been more complex than it is now; a web of related issues: nuclear, racial, religious and geo-political are stirred into an explosive mix. Vanunu's plight seems to epitomize this concoction: he is a Jew who converted to Christianity, a stranger amongst Palestinians, a man with whom the international community is ill at ease. 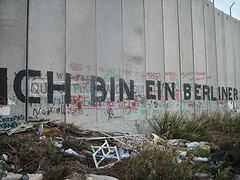 Nor are the problems of the Middle East likely to be resolved soon - the international resolve, as well as that of the immediate combatants is simply not there: in August 2009 - in the wake of a long catalogue of such wrongs - Fleming recounts how the eviction of Palestinians from the Sheikh Jarrah area of Jerusalem drew international censure from the European Union, the UN, Britain and the USA: yet nothing has been done to this day to address such breaches of international law. 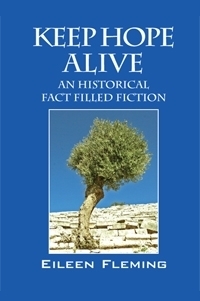 Indeed, one of the recurring themes in Eileen Fleming's book and in Mordechai's many interviews given since his release from prison in 2004 has been the fact that although the international community tacitly acknowledges Israel's nuclear capability, it has never subjected Israel to a single Atomic Weapons Authority Inspection. It is the white bear in the corner no-one will speak of. There is much to exercise activists like Eileen Fleming. In some ways Beyond Nuclear is a dispiriting tale of episodic and endemic complaisance by the international community to serious abuses of international law, an unending cycle of oppression, resistance and terrorism; but it is also an affirmation of the ability of human beings to speak out, their willingness to take enormous risks with their own personal safety and to refuse to be cowed by the might of the State. And there are the occasional brighter moments - for instance, the Israeli soldier playing with Palestinian children and Fleming's making contact with him from a Palestinian position and exchanging gestures of goodwill. It is a reminder that human beings populate such stories, committing kindnesses and atrocities with seeming equal randomness. But a state is not the sum of its people, it has its own personality. Israel, as a State, is determined to defend itself and believes its prime objective is to protect its security by whatever means it deems necessary. Fleming quotes Archbishop Desmond Tutu saying that after a visit to Israel in 2006: "Israel will never get true security and safety through oppressing another people." Such wisdom and perceptiveness seems to fall on deaf ears, however - even when it is spoken by respected people like Tutu and it is hard not to escape the conclusion that until people of good will on both sides control the argument, progress will not be made. Eileen Fleming's book reveals the frustrations of the truly committed in dealing with the half-committed - and the merely good-willed. There is no doubting the strength of her own convictions and sense of mission - she will always, one suspects, have difficulty in finding people who can match her relentless energy and conviction. The truth, as Oscar Wilde observed, is rarely simple and never pure. And by the same token, the lesson Eileen Fleming would have us draw would be that the perceived good is seldom so good as to be worth it. Follow MJ Maguire on Facebook. Even if I knew the world would end tomorrow; I would plant an olive tree today." Eileen Fleming's first of seven journeys into Israel Palestine resulted in "KEEP HOPE ALIVE". This tale is a fictionalized retelling of the well remembered memoirs of a 1948 refugee from the Upper Galilee who made his way to the USA and realized the American dream. After a lucrative career in the Defense Industry during the Cold War and THAT DAY we call 9/11, Khaled Diab brought together American Jews, Christians and Muslims to respond to evil with good by founding the 501 3-c Olive Trees Foundation for Peace. "Keep Hope Alive" tells his story and is an historical chronology with connections to antiquity, and hope for the future. "Keep Hope Alive" is also Eileen's spiritual journey told with humor and insight through six fictional characters who represent six ways to intuit God. "I have just finished reading your wonderful book ‘Keep Hope Alive’. I found it most inspiring and can see in your story the influences of your Spiritual journey – Merton, Dorothy day, Fox, St. John of the cross, Francis!! All of whom I share as they are, I believe, great guides to the Spiritual journey. The book brought me closer to you Eileen – and I was Moved by your great heart and compassion for all those who suffer – Especially the Israelis and the Palestinians and people of Gaza.Thank you for your faithfulness to them (and for helping to provide and Plant so many Olive trees – a real symbol of hope for the Palestinians." - Mairead Maguire, June 1, 2009. For One Woman, September 11 Sparked an Odyssey of Faith to the Palestinian Territories" In my dream I stood at the edge of a dried up pool where crumbling stone columns were overgrown with vines and weeds and scores of doves and pigeons nested and flew. To my right was a large shade tree, but to my left I saw a few square squat dwellings with large satellite dishes attached to them. I remembered thinking the moment I woke up from that dream what a strange place it was, but then I quickly forgot all about it. That is, until the afternoon of June 12, 2005, four years later, when I found myself standing at the edge of a dried up pool where crumbling stone columns were overgrown with vines and weeds and scores of doves and pigeons nested and flew." Impelled, compelled, and propelled by her faith as a progressive Christian, Eileen Fleming has journeyed four times to the Occupied Palestinian Territories. There she met with democratically elected members of Hamas, scores of Palestinian Christians and Muslims, and a few 21st-century prophets. The pages within this brave new work contain some of those interviews and her experiences listening to Christians, Muslims, Jews, secularists, anarchists, Nobel Peace Prize Nominees, and the whistleblower of Israel's underground WMD Program. 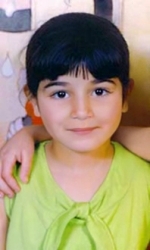 This fascinating portrait will open your eyes and heart, and you will look at the Middle East in a new light. 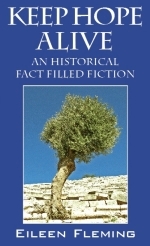 July 15, 2007 By Theodore Micceri "Themistocles"
Eileen Fleming's Memoirs is both an extremely interesting and highly informative account of the history and current situation in occuppied Palestine. The author provides a considerable amount of well documented information regarding the roots, history and anti-semitic nature of Zionism in both it's Chrisian and Jewish forms. She clearly delineates the Theocratic Ethnocracy that is today's Israel and demonstrates though example after example how it disciminates against all Goy (non-Jews and obviously inferior peoples), whether they be Christian, Muslim or of any other religious belief. As a result of this persecution, Christains today make up fewer than 2% of Israel's population although they represented 20% in 1948. Israel's consistent persecution has forced most Christians to flee their homeland and seek asylm in other nations. Her historical explications showed me the clear parallels that exist between the Italian Mafia and the Israeli Hagganah and it's spin-off's like the Irgun and the Stern Gang. Perhaps the most interesting section is her extensive description of Mordeci Vanunu, the secular Jew who told the world about Israel's Atomic Bombs and as a result, spent 18 years imprisoned, mostly in solitary confinement. She likens him to Biblical prophets, who pointed out impending doom. I recommend this book to anyone who has an interest in the future of the world, because, as Britain's Tony Blair noted, probably 70% of the world's conflicts can be traced directly to the Israeli/Palestinian situation.